Zimbabwe's political crisis reached a boiling point last week with the dismissal of Vice President Emmerson Mnangagwa, clearing the way for President Robert Mugabe's wife, also a vice president, to succeed him. Addis Ababa, Ethiopia: Zimbabwe's military took control of the country and its longtime leader President Robert Mugabe early Wednesday, capping a political showdown over Mugabe's apparent attempts to install his wife as successor. A televised announcement after tanks and troops rolled into the capital, Harare, insisted it was "not a military takeover." Despite the assurances, the events bore all the hallmarks of a coup, with military vehicles stationed around the city, the army taking over the television station and a uniformed general issuing a statement. The move by army Gen. Constantino Chiwenga came as the struggle over who will succeed the country's increasingly frail 93-year-old leader came to a head. Mugabe has ruled since he led the country to independence from white minority rule in 1980. "We wish to make it abundantly clear that this is not a military takeover," said the statement read by Maj. Gen. Sibusiso Moyo. "We are only targeting criminals around him who are committing crimes that are causing social and economic suffering in the country." The fate of Mugabe and his wife, 53-year-old Grace Mugabe, who increasingly looked set to succeed him, was unclear but they appear to be in military custody. "Mugabe and his family are safe and sound and their security is guaranteed," said Moyo. Mugabe's offices had a tank blocking the road in front of it and large numbers of soldiers milling around. The possible ouster of Mugabe would remove one of the fixtures of African affairs for nearly four decades as an unwavering critic of many Western policies and international institutions. Mugabe's supporters hail him for moves such as dismantling white-owned estates and other holdings. Yet he also was reviled as a despot who brutally crushed dissent and allowed the once-envied country to sink into a cycle of deepening poverty and stratospheric inflation. Overnight, witnesses reported tanks and soldiers moving around the city along with sounds of gunfire and explosions. By morning, soldiers in armored vehicles controlled major intersections near government buildings. In Harare's central business district, all seemed normal by midday with itinerant vendors taking advantage of the many closed businesses to sell their wares at intersections. Police and plainclothes agents normally stationed around the Parliament building could be seen sitting on the ground surrounded by armed soldiers. Local media reported that several members of the ZANU-PF ruling party have been detained by the military, including cabinet ministers. "We are only targeting criminals around him [Mugabe] who are committing crimes that are causing social and economic suffering in the country in order to bring them to justice," Maj. Gen. SB Moyo said on television. "Zimbabwe is open for business. 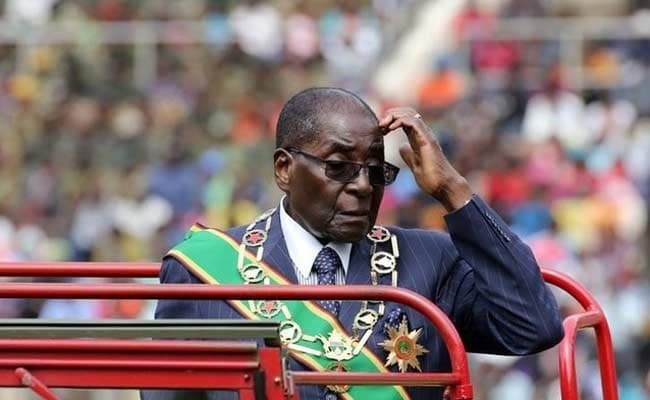 There was no coup, but a bloodless peaceful transition," said one tweet while another noted "an elderly man who had been taken advantage of by his wife being detained," an apparent reference to Mugabe. "We are not in the 1960s and 1970s anymore, when coups in Africa were left, right and center - I think they are trying very hard to appear progressive," he said. "However, of interest to democracy, the elections scheduled for next year, will they take place?" Zimbabwe's political crisis reached a boiling point last week with the dismissal of Vice President Emmerson Mnangagwa, clearing the way for Mugabe's wife, also a vice president, to succeed him. The move exacerbated divisions in the ruling ZANU-PF party, where the youth faction is firmly on Grace's side, while the older veterans of the struggle against white rule look to Mnangagwa. At one point last month, Grace Mugabe even warned that supporters of Mnangagwa were planning a coup. Mnangagwa, who fled to neighboring South Africa, has strong support with the military and on Monday army head Chiwenga threatened to "step in" to stop the purge of Mnangagwa's supporters. The party's website reported that Mnangagwa was back in the country and would be taking over leadership of the party. South Africa's president, Jacob Zuma, said he was sending an envoy for emergency meetings with Mugabe and top military officers. Political commentator Maxwell Saungweme said the military will likely try to pressure Mugabe to step down in favor of Mnangagwa as acting president. "But this plan may not pan out as Mugabe might resist this. So the whole thing may be messy," he warned. Once a wealthy breadbasket for the whole region, Zimbabwe's economy and especially the prosperous agriculture sector has suffered in recent years. The currency has collapsed and at one point the country was experiencing devastating hyperinflation. Mugabe's rule has been blamed by critics for the economic decline. In its statement the army said it was "pacifying a degenerating political, social and economic situation in our country."